Alec is happy to visit Day Nurseries, Nursery Classes, Children’s Centres or Playgroups. 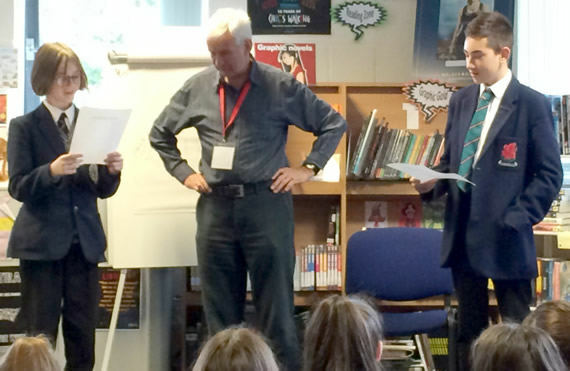 He’s visited settings across the country, as part of the ‘Every Child a Talker’ initiative and other projects. Sessions are normally 25-30 minutes each, and work best with three year olds or older. Alec chooses simple stories, sometimes using puppets, with actions, choruses or animal noises. He’ll include both stories from memory and from picture books, plus rhymes too – choose your programme with him first. You could invite parents, grandparents or carers to sessions. They’ll pick up reading aloud tips – and it promotes the idea of Dads reading! Alec’s happy to talk to parents afterwards. A half day could include three sessions, with breaks and possible talks. Why not share a day with another setting nearby? The fee would be less, and the travel costs would be halved. Your local Early Years Service or School Library Service might help with this. Stories are vital in the EYFS curriculum. Having a ‘special visitor’ can give a real boost to this, and Alec’s happy to give workshops to staff, too. Contact him to find out more!